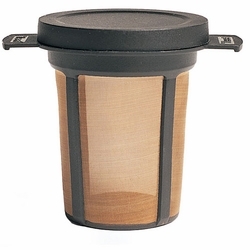 As a Seattle-based company, the folks at MSR are not at home on the trail without a cup of rich aromatic, freshly brewed cup of joe, which is why MSR introduced the Mug Mate coffee/tea filter. It's low profile enough to be stored in just about any mug or cup, and you won't have to worry about packing out soggy paper filters. The MugMate is capable of making café-quality brew for the outdoor java junky.